We are very excited to be teaming up with our good friend and former scholar in residence--Mexican writer and scholar Salvador Olguín--for the 4th iteration of Muerte en Mexico, in which we travel to Mexico to visit various Dia de Muertos, or Day of the Dead, celebrations, while also learning about the holiday's rich and fascinating history. This year we will explore the states of Yucatan and Campeche where we will learn about Hanal Pixan, a Mayan variant of Dia de Muertos. The highlight will be a visit to the small town of Pomuch, where we will witness the extraordinary Cleaning of the Bones ceremony. We will also attend the famous Festival de las Ánimas (“Festival of the Souls”) at the General Cemetery in Merida, as well as a Day of the Dead celebration in the historic fortified town of colonial Campeche, an UNESCO World heritage site. There will also be--as always--visits to historic sites, colonial churches and traditional markets, as well as special tours, festive gatherings, and lots of opportunities to sample excellent local food and drink. The trip will take place from October 31 - November 4, 2019; reservations must be made by July 1. Full details follow. We hope very much hope that you can join us! A 4-day trip to Mexico curated, organized and guided by Mexican writer and scholar Salvador Olguín for Borderline Projects and Morbid Anatomy. Includes: Two Day of the Dead celebrations in the southeastern states of Yucatan and Campeche, where the Mayan variant of Dia de Muertos, better known as Hanal Pixan, takes place from October 31 to November 2 in remembrance of friends and relatives that have passed. The highlight of this year is a visit to the town of Pomuch, where people perform a cleaning up ceremony by brushing the bones of their deceased relatives during Dia de Muertos. Cost: $685.00 USD (Includes all hotels in double-rooms, luxury ground transportation, museum admissions, guided visits, and breakfasts; airfares not included). PLEASE NOTE: non-refundable down payment of $365.00 USD required by July 1 to reserve. Email info@borderlineprojects.com with questions. This Halloween season join us for a very special 4-day, 4-night trip to Mexico for our favorite holiday, Dia de Muertos, or Day of the Dead. This year we will be visiting the legendary Yucatan Peninsula, which comprises the former territories of the ancient Maya lowlands, where the main centers of the classic Mayan civilization were established around 900 BC to 300 B.C. 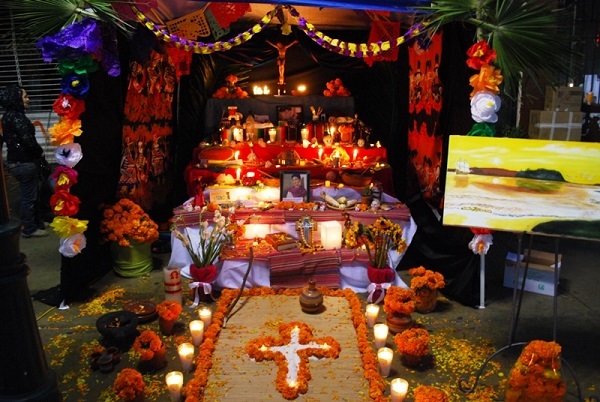 The rich history and heritage of the Maya, coupled with the mesmerizing landscape, natural resources and cultural diversity of the Yucatan Peninsula, make it one of the great civilizing centers of humanity, and the origin of one of the most remarkable variants of the Day of the Dead tradition in Mexico: The Hanal Pixan or Comida de las almas (“Food for the souls” in Mayan language). It encompasses 3 days of celebrations (the Hanal Palal, the U Hanal Nucuch Uinicoob, and the Ha Hanal Pixanoob, consecrated to the deceased children, adults, and all souls, respectively. Our journey will take us to two major celebrations of Hanal Pixan: The great Festival de las Ánimas (“Festival of the Souls”) celebration at the General Cemetery in Merida, the largest city of the Yucatan Peninsula and capital of the homonymous state; and the extraordinary Cleaning of the Bones ceremony that takes place during Hanal Pixan in the small town of Pomuch in the state of Campeche. This tradition is rooted in the bigger frame of the unique ossuary burial practices of this town and its cemetery, in which the graves are kept open all year long, and the exposed remains of deceased relatives are part of everyday life for the inhabitants of Pomuch. On this tour, we will get an exclusively intimate opportunity to join families for this both solemn and cheerful ritual. 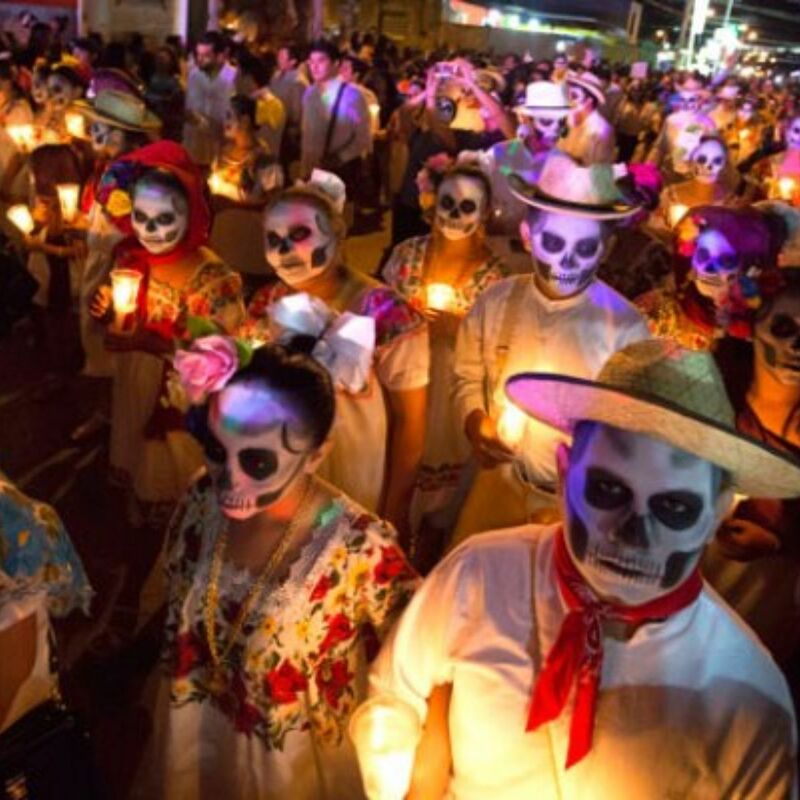 The tour will also take us to join the Day of the Dead celebrations in the historic fortified town of Campeche, a former harbor town from the Spanish colonial period in the New World, and a UNESCO World heritage site. Some other sights that will discover during this trip include the¨White City” of Merida, with The Paseo Montejo Avenue and historical district of this beautiful city founded in 1542, hosting a plethora of architectural jewels, monuments, churches, monasteries, and museums, such as the Canton Palace Merida Museum of Anthropology and the Great Museum of the Mayan World. We will also visit the city of San de Francisco de Campeche, where we will enjoy the historical district, with its distinctively baroque style, sparkling with Andalusian Moorish influence. We will also admire some of the doors and bulwarks built in the Muralla, the imposing fortified wall that surrounds the City; A true gem of 17th and 18th century military architecture, it famously protected the inhabitant from numerous pirate attacks. Some of these fortifications now house interesting sites like the Xmuch'haltún Botanical Garden and the Museum of Mayan Archeology at the San Miguel Fort, just to mention a few. We will also, as always, be visiting traditional markets, local cemeteries, and other lesser-known sites relevant to the Day of the Dead celebrations. We’ll enjoy special tours and gatherings to share and immerse in the celebrations honoring the departed among the warm people, rich culture, and dazzling gastronomy of the Yucatan Peninsula. Day 1 – OCT 31, 2019 - Hanal Palal / Halloween We recommend arriving in Merida on the morning of Halloween, October 31, to visit some sites and enjoy the many Day of the Dead special celebrations held around the City. Staff will be at the hotel early in the day for check-in and general information. In the evening, we’ll attend the Festival de las Ánimas celebration. Daylight guided tour to the cemetery to witness Day of the Day family gatherings, offerings and cleaning of tombs traditions. Free time for special interest sites and tours. In the evening we will join the massive Paseo de las Animas procession. 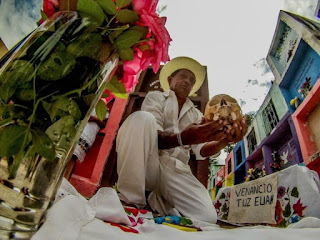 Early in the morning after breakfast, the bus will depart to the state of Campeche to witness the Brushing of the Bones ceremonies in the small town of Pomuch, located in the Hecelchakan municipality. We will visit the ossuaries and open graves at the local cemetery. On our way there, we will make a stop at Dzitbalche, a small village that’s part of the Calkiní Artisanal Mayan Route to do some shopping. At the end of the day, we will depart to the capital city of San Francisco de Campeche to join the festivities during the last Day of the Dead celebration in the fortified city. Daylight guided special tours to museums, cemeteries, markets and historical sites in the walled city. Optional tour for this day: a visit to the Edzna Archeological site, dating back to the Late Pre-Classic Mayan period (300 B.C. to A.D. 300). At the end of the day we will depart back to the city of Merida on board our luxury bus. Cost: $685.00 USD – airfares not included, non-refundable down payment of $365.00 required by July 1 to reserve. Email info@borderlineprojects.com with any questions. The $685.00 USD fee covers land transportation in a luxury bus, traveler's insurance, lodging (double rooms at hotels), taxes, breakfasts, guided tours, tickets to museums, special visits to some of the sites, and special treats.